Over 150 people attended the June 2 webinar presented by ARTBA’s Transportation Development Foundation (ARTBA-TDF) to launch a new Safety Learning Management System. 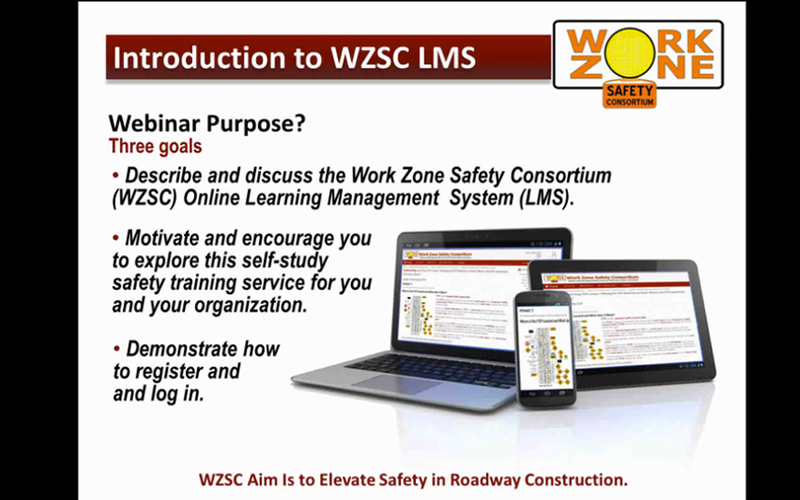 The Internet-based training platform gives safety professionals, traffic engineers and roadway construction workers 24/7 access to high-quality training and education from the convenience of their desktop computers. Listen to webinar on demand. Under a contract with the Federal Highway Administration (FHWA), ARTBA-TDF has provided specialized, in-person safety training for more than 50,000 transportation construction industry professionals over the past 10 years. Now, ARTBA-TDF has taken key components of that classroom content, added a wide range of new material on key topics, and created an online education environment. Available courses include: temporary traffic control set up, sight distances in work zones, developing internal traffic control plans, developing transportation management plans for work zones, work zone safety and mobility improvement strategies, temporary traffic control devices, and fundamentals of work zone safety for seasonal and temporary workers, and more.